Jan. 1 is one of my favorite days of the year. It is a day that holds promise and hope. It is a time of reflection on the past and to embrace self-improvement, set goals and get excited about what lies ahead. We tend to go toward what is comfortable, habitual and easy. Many of us make a conscious attempt every day to change, and change is hard. Whether it is the choice not to stop at District: Donuts. Sliders. Brew. in the morning, stalk your ex-anything on social media or pass up a Happy Hour and instead choose to pass out at CrossFit, a true transformation of self and soul is a challenge. The New Year gives us the opportunity to try new things. It can be as simple as trying a new lipstick hue, or as difficult as trying to become more sensitive to others. At ALG Style, we are always attempting to nudge people out of their comfort zone. We want women and men to look and feel like themselves (only better), and, with a few small tweaks and subtle changes, we make that happen. For men, it might be as effortless as purchasing denim that fits properly from our friends at Saks Fifth Avenue and, for women, it could be highlights to brighten up a complexion from Paris Parker Aveda Salons and Spas. Each of the Angelique Boutiques is singular, but all still have a harmonious theme of polished chicness exclusive to each respective neighborhood. These posh yet sweet boutiques are perpetually ahead of trends. 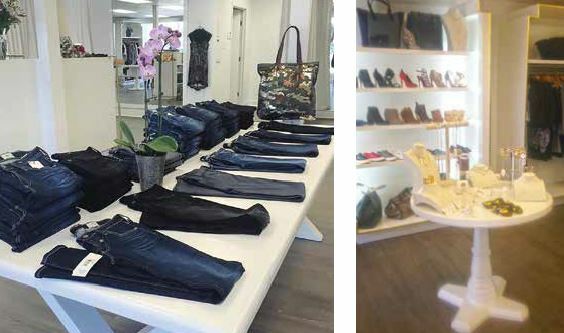 Angelique Boutiques provides customers with everything from the basic wardrobe requirements for a morning ride to carpool to a selection of sassy and stunning attire for a night on the town. Heather Rutherford Catalanotto, a long time Angelique alum, started as the manager at the Maple Street location. She currently is the co-owner of Angelique on Magazine Street and the new location in Lakeview. She and her young family are residents of the Lakeview area. “I am so excited to bring reasonably priced fashion to the lake front and be part of the tremendous rebirth of Lakeview,” she says. Angelique Lakeview has affordable pieces that cover you from head to toe, with party dresses that are perfect for Mardi Gras luncheons and comfy kicks by Superga to chase after toddlers. Embracing change and all that is new for 2016, the girls at Angelique urge you to take chances. “Denim every way, shape or form is trending for the upcoming season,” Catalanotto says. Take a risk in 2016 wearing a denim jumpsuit or a denim dress, or by toting a denim handbag. Happy local shopping in 2016!